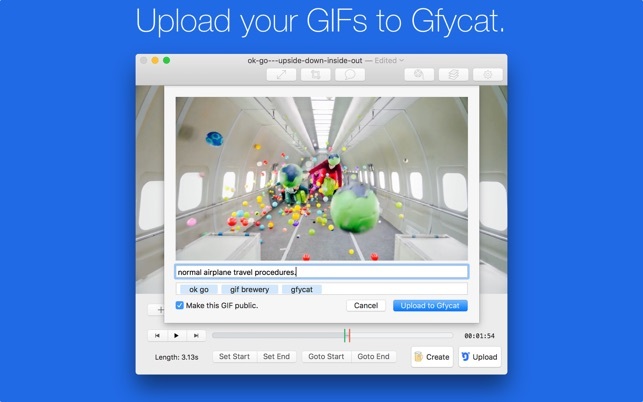 • NEW: GIF Brewery now enables easy in-app uploading to Gfycat! 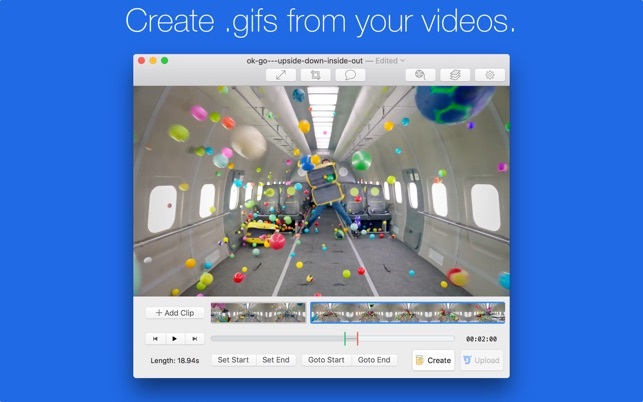 • 9to5Mac: "GIF Brewery 3 brings a polished animated GIF-creating experience to the Mac"
• MacWorld: 4/5, "GIF Brewery makes it a snap to convert video files into animated GIFs." 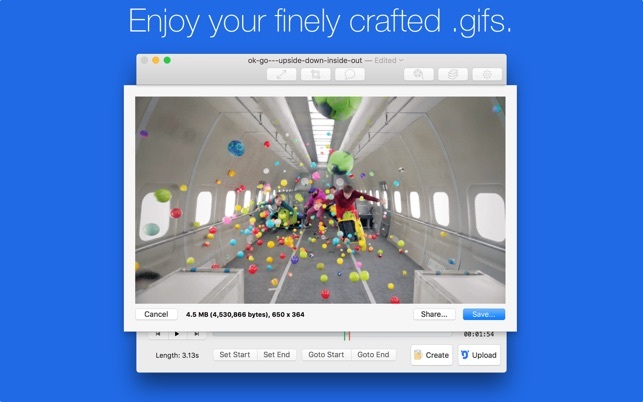 • Mac.AppStorm: 9/10, "A great app to create your own customizable animated GIFs." 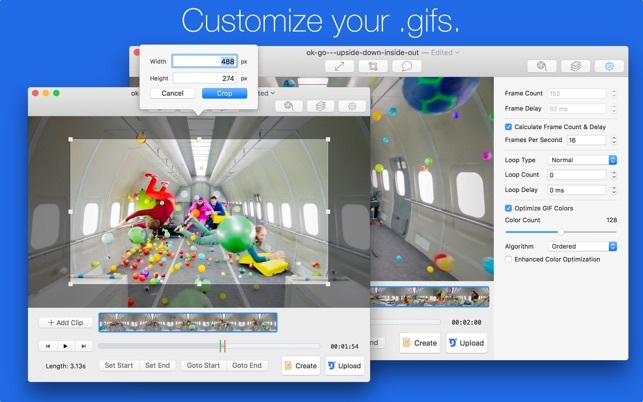 • The Verge mention: "For OS X, we’ve been having fun with GIF Brewery ... It’s simple, intuitive"
• Buzzfeed article: "... impress your friends and win the hearts of many with your GIF-making prowess!" * Screen recording now will now not be quite as forgetful of your previously used settings. The final output can be good, with relentless tweaking and resets. Bugs and missing essentials make this a pain to use. No way to remove individual frames (no - key for the actual editor). You can add frames, duplicate them, generate more to infinity, but it's impossible to remove any of them from the 'saved' list. 1 bad click and you must start over from scratch. Same with slices, there's a key to add slices, but no way to remove them. Importing is a convoluted mess of converting gifs to mp4 using the media stitcher then back to the editor to convert the mp4 BACK to a gif (surprisingly their media stitcher LETS you remove frames, why not the actual editor!?)... but then their gif editor interpolates the timing from the mp4 and changes the frame count all over again. So then back to manually selecting frames, this time in the editor, updating custom timing for every frame, and hoping you haven't accidentally added a bad/unwanted frame, otherwise you have to start over again. Feels like an unfinished work in progress. This needs a very basic way of inserting and deleting individual frames, like, literally that's what an animated gif is, yet this program makes it a terribly convoluted process. I am a video editor and occationally clients was GIFs of shots or sections to share. 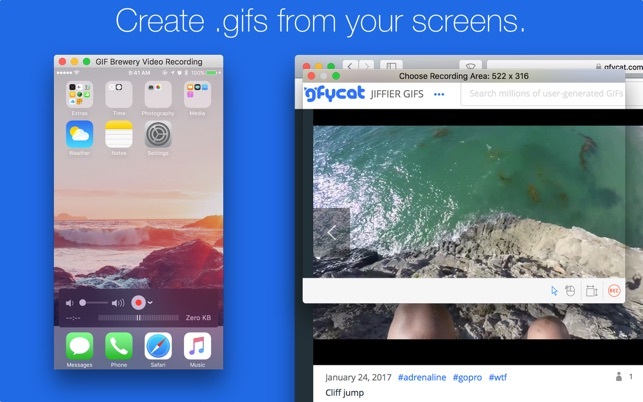 GIF Brewery is easy to just stick in a video clip and get something quick but it is also the most powerful to tweak settings and fine tune. The biggest problem with GIFs is they get huge fast and the way to shrink them is resize the video or reduce the colors used. GIF Brewery has a great way to step down the colors used one by one until the size and quality trade offs are acceptable. The only problem is the time it takes to make the GIFs. Some parts of the creation process are multi threaded but some parts are not. If you are trying to optimize and going through the creation process over and over that part kind of drags. The creation of the GIF maxes out my iMac but the color checking phase runs at 1/8 of max.